Sold in over 27 countries and on several high-end e-commerce sites, the eponymous Adriana Degreas brand is today a luxury beachwear classic. Since 2001, the Brazilian designer has been creating chic and contemporary swimsuits and beachwear inspired by her South American roots. Adriana Degreas mixes retro touches and modern cuts to give sophisticated, feminine pieces that Jennifer Lopez, Naomi Campbell and Heidi Klum can’t get enough of! Just like Adriana Degreas, Jasmin Larian celebrates clothing’s aesthetics. When she launched her Cult Gaia brand in 2012, she had a sole ambition: creating pieces like real works of art. Inspired by Gaia, the Greek Earth goddess, the imperfection of nature, women and their sensibility, Jasmin Larian designs simple, timeless clothing with refined, carefully worked finishes. For, according to the American designer, “a good design lies in simplicity”. Quite simply. “Luxury, calm, and sensuality.” This verse by Baudelaire could perfectly illustrate the capsule collection by Cult Gaia x Adriana Degreas. 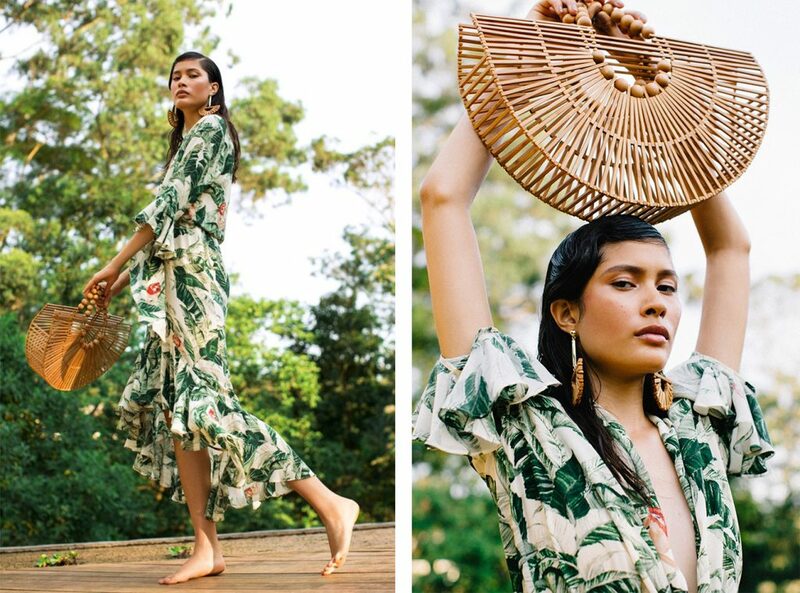 Tropical prints, exotic birds and shimmering colours… Adriana Degreas and Jasmin Larian offer vibrant pieces, perfect for lounging about all summer long. In perfect harmony, the Californian brand’s effortless chic style blends with the Brazilian label’s avant-garde DNA. The perfect cocktail for this summer! Featuring bikinis, one-piece swimsuits, dresses, kimonos, etc., the collection looks to be both casual and elegant, refined with delicate details. With pleats decorated with amber-toned beads and sheer detailing subtly revealing the skin, the designers have created cutting-edge beachwear we’ll love wearing and wearing again year after year. Available from April in the Matches Fashion online shop, the capsule collection will then be sold in Cult Gaia and Adriana Degreas boutiques… undoubtedly the unmissable collaboration of the summer!